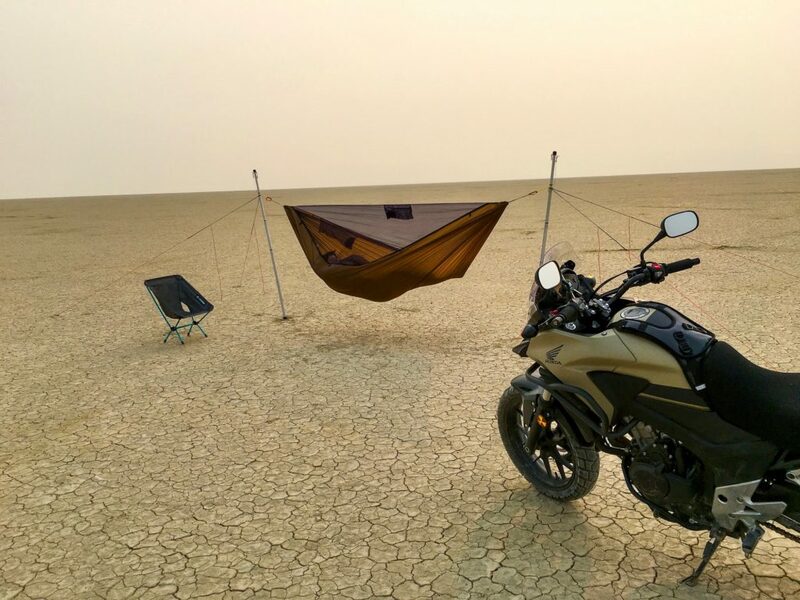 Tensa Solo with Dream Hammock Darien, jealous Helinox chair, and Honda CB500X, not included with Tensa Solo, on either Mars or Oregon’s Alvord Desert in fire season. Photo by Cliff Volpe. 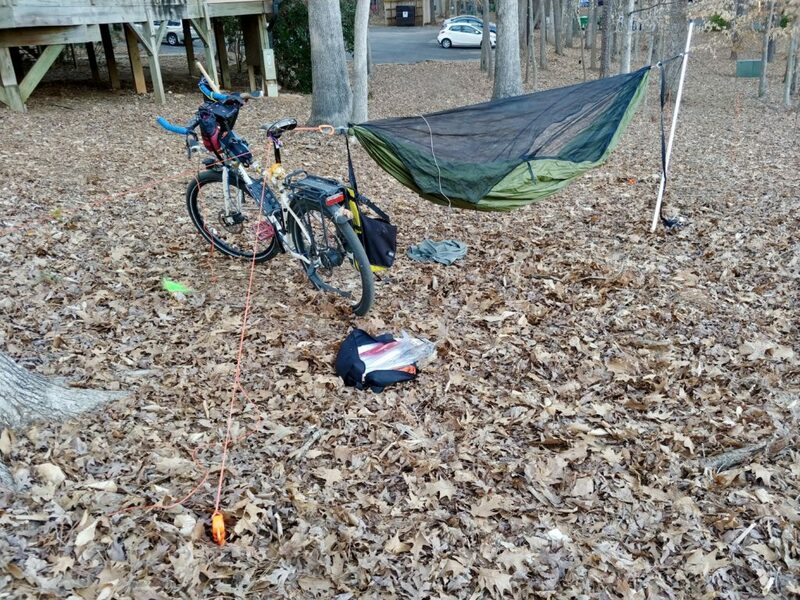 Bikepacker’s dream. Yes, that’s a Surly Troll with B+M dynamo lighting system, Ergon GP3 Biokork grips, Brooks Cambium C17 Carved saddle, Schwalbe Big Apples, and Alfine internal gearhub holding up the head end, not that we notice this sort of thing. Even this earlier version of Tensa Solo is far superior to ACME hammock stands. Saguaro is not for hanging. Dream Hammock Darien. Photo by Cliff Volpe. Which should you choose, Tensa4 or Tensa Solo? It comes down to reliability versus portability. 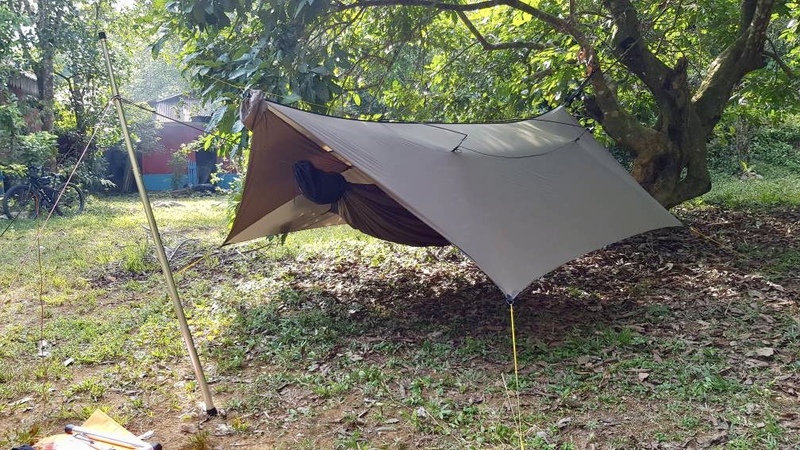 Tensa4 is extremely reliable, able to be set up indoors or out, but at 10-13 pounds, it’s not suitable for backpacking. Tensa Solo at only 2.3lbs (1.04kg) per side is pack friendly, but you must be able to set down strong anchors, two per side, making it less reliable in uncertain ground conditions. 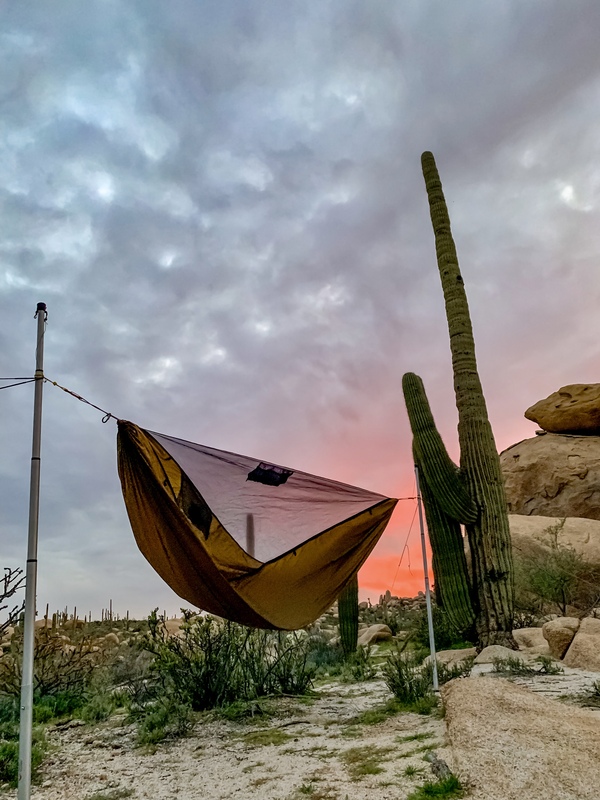 It’s still very likely to work in most places, but that last lacking measure of confidence can loom large when you depend on a hammock for rest and shelter. You don’t have to choose: you can convert one Tensa4 into four Solos with our Conversion kits, so you can have both at far less than the cost of buying separately. Tie to the base of a firmly rooted woody shrub or exposed rock feature, with or without the Orange Screw reinforcing. Excavate any very loose soil until you uncover firmer, and drive the anchor into that. Hit a big rock, root, treasure chest? 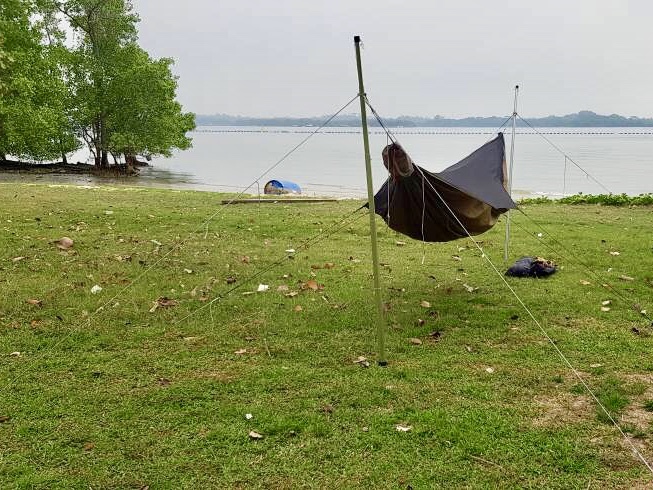 Excavate enough opposite the hammock side either to tie to the object itself if massive, or to drive the anchor in behind it. Check your anchors between nights, repositioning if they seem loose, especially if there’s been rain. Anchors driven further away from the stand, with longer guylines, tend to hold better than those positioned close, soil conditions being the same. Heavier users, or those facing exceptionally loose or soft muddy ground devoid of reinforcing roots: more anchors. We include only 2 per pole, but more work. Pass the guyline through the anchor heads in a manner that equalizes the load on them. When will the electric version be available? I’ve been nervous while in storms hitched to a lightning rod. Does that count?